Today is the unofficial start of VMworld US 2018 in Las Vegas. Johan van Amersfoort, Marco van Baggum, Laurens van Duijn and myself are representing #TEAMITQ during the conference week. This wasn’t my first time in Vegas, but it was my first United States based VMworld. To have a conference like this in Vegas is just amazing. The first impression was kinda overwhelming in terms of the size of the breakout sessions section at the Mandalay Bay. Even though the Solutions Exchange wasn’t opened yet, it immediately felt a lot bigger compared to my first VMworld in Barcelona last year. I started my day with.. a coffee, of course. Since the alarm went off around 6:00 that was a real requirement for starting the day 🙂 I arrived at 7:15 at VMworld venue and headed directly to the registration desks, where it was a complete chaos. There were very long queues at the badge pickup desk. It definitely didn’t go as the VMworld organization planned upfront. But I was lucky to get it in time, I heard some other people needed to wait an hour for their badges. At 8:00 the VMware vSphere 6.7 upgrade workshop started at the Luxor, where I was staying. The workshop was presented by Nigel Hickley, known as @vCenterNerd in the community. In the afternoon I joined the vSphere HTML5 client engineering team for an interactive workshop. Which was really cool. They’ve shown everything were they have been working on lately. And also gave some insight on some features that are might come into the H5 client in the near future. During the evening I met up again with my ITQ co-workers and we went to the VMUG member party. After a great first day at VMworld US, the second or also known as the official first day of the conference is about to start with the General Session. And as expected, some announcements have been made. Please refer to Marco van Baggum’s blog post about all the announcements that were made on stage. Another ITQ co-worker Mischa Buijs wrote an awesome blog post about all the new product announcements during the conference week. You can find it here. 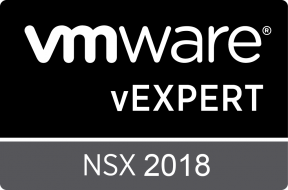 As I am trying to attend sessions with content that’s currently kinda out of my comfort zone during this VMworld, I went to some Kubernetes and NSX-T sessions to get more in-depth knowledge about these products. Also attended a cool deep-dive session about VxRack SDDC in conjunction with VMware Cloud Foundation. Besides the sessions, gathering swag is kind of a common habit during conferences like VMworld. Vendors having booths a Solutions Exchange and some have great giveaways. With the 12000mah equipped external battery power bank of Western Digital as the absolute best swag I did got. The ITQ team started the night with some fantastic ribs and beer to be prepared for the Rubrik Party at Hakkasan Las Vegas Nightclub! At the end afternoon, I attended The EUC community geek evening tech talk! Which went on until the evening. Initially, it felt kinda weird attending, since I’m not an EUC guy. But it was actually quite interesting, and most of all fun. The event even came with beers, snacks, and delicious pizza’s. Combined with the awesome presentation of co-worker Johan van Amersfoort about how to run a multiplayer Formula 1 game via Horizon View in a VDI, it was an awesome evening. No General Session today at VMworld. So I started the day off with some nice coffee and a croissant while heading to the venue. There I attended together with the whole ITQ team another session from Johan; How to design a VDI environment, the VCDX way at the VMUG booth. During lunch time I headed actually for time to the VMworld Meals itself to have lunch over there instead of going to the Subway. Because I wasn’t able to in my first few days since I had scheduled sessions around lunch time which I didn’t want to miss. During the afternoon I spent a lot of time in VMvillage working on the blog and some other stuff which needed to be done. Only had one interesting session left this afternoon: NSX-T Edge Services: Design And Deployment Considerations. At VMvillage closing time I was able to participate in the non-official, official vBeards 2018 annual photograph. And I even managed to get a hold on one of the much-wanted vBeards stickers. vBeards is a social group for bearded VMware professionals. No, it isn’t really a serious thing. But it is basically just fun, and good to meet new people from the community. I was probably one of the few who did not go to the VMworld’s official party: VMworld Fest. I scheduled an exam on Thursday 8:00 AM, and I just wanted to spend some time on preparations for the exam. My alarm went off again very early this morning. I woke up around 6:30, got to the Starbucks as like every morning prior to going to the conference. I was right in time to start with my VMware vSAN Specialist exam at 8.00 am. The hardest part of this was actually finding the exam center at this huge conference instead of passing the exam itself. I passed with a score of 433/500 and I’m happy I can add another certification to the backpack. At 9:00 am I have watched to last General Session at VMworld US 2018 together with the whole ITQ team at the VMvillage. You already could see that it was kinda ending already. Not that much people anymore, and with the Solutions Exchange already closed it didn’t feel as a bustling conference anymore. Since I didn’t have any more super duper interesting sessions to attend today, I kinda relaxed the rest of the day with my co-workers. We went to the pool and finished the day and our VMworld US trip at The Venetian with a nice Italian dinner. Thanks to everyone who I spent time with during the VMworld 2018 US event. It was really cool to meet a lot of new people, and I certainly enjoyed the conference. Now looking forward to heading back to the Netherlands and get back to work again with some amazing projects at ITQ.